Note to Editors: There is an infographic associated with this press release. Cogeco Peer 1 today announced the expansion of Multi-Protocol Label Switching (MPLS) connectivity services to customers in the United States and Europe, providing more businesses around the globe with a holistic solution that can help reduce IT complexity and enable digital transformation. "Cogeco Peer 1 MPLS enables businesses globally to leverage the best in cloud, hosting, colocation, managed IT, security and connectivity services together, through a single service provider, on one scalable, easy-to-manage network," said Bertrand Labelle, Vice President, Marketing and Innovation. "In a digital age of data-hungry applications and cloud-based technologies, organizations now need powerful connectivity solutions that can keep up with the growing demand for seamless mobility solutions, Internet of Things (IoT) devices and big data analytics capabilities." According to Gartner, one of the world's leading research and advisory companies, there will be more than 20 billion Internet-connected "things" worldwide by 2020, and more than half of major new business processes and systems will incorporate some element of the IoT. Flexible, cost-effective and easy to administer, MPLS core network technology is ideal for organizations in the midst of a digital transformation and looking to reduce costs, improve network security, optimize efficiency and become more agile. MPLS technology enables Cogeco Peer 1's global customers to build a secure and private 'any-to-any' network that connects multiple locations with the lowest latency routes. Thanks to its fully managed and diverse network with over 48,000 km of fiber routes, businesses with multiple locations in multiple countries can also leverage the power of MPLS. 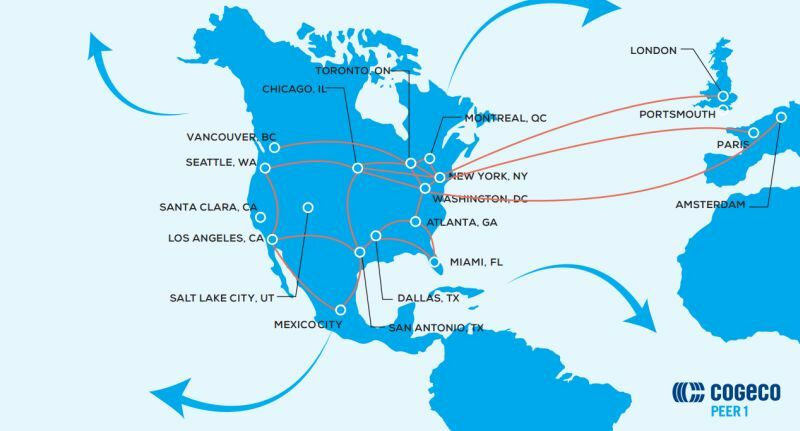 "With 16 data centers, our global FastFiber Network® and more than 50 points of presence in North America and Europe combined, our global customers can now do more with the power, reliability, and reach of the Cogeco Peer 1 network," added Labelle. "MPLS is a customer's first step towards true network convergence, offering design flexibility that lets you take advantage of converged data networks that deliver optimal network performance." The Cogeco Peer 1 FastFiber Network® uses MPLS to efficiently and securely transmit business applications and data over a single network access, giving businesses their choice of either Ethernet or IP VPN services. Delivering reliability, manageability and multiple service tiers, Cogeco Peer 1's Ethernet and IP VPN services can help businesses of all sizes customize their networks with the service levels they need to run more efficiently.